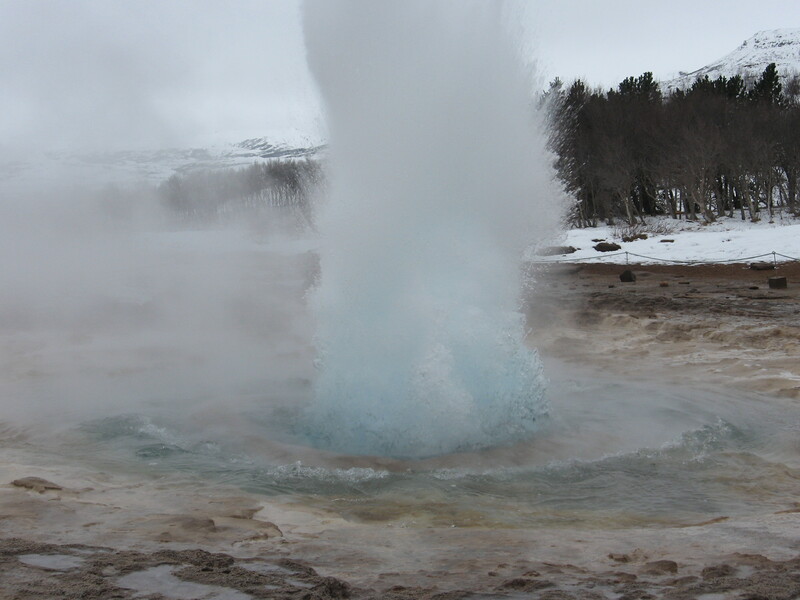 – Reykjavik is the northernmost capital in the world, and certainly the farthest north I have ever been. The entire country of Iceland isn’t very big, though – it’s population is about 300,000 of which about 60% live in Reykjavik. That is pretty much the combined combination of Fremont and Berkeley, in the Bay Area. – The baggage handlers in SFO or JFK decided to search my check-in bag, but they forgot to put the lock back on. I had bought a TSA-approved lock some years back (so they can open the bag without breaking the lock). Sadly, it’s virtually impossible to reclaim that lock from them (they want to see the receipt, proof that it was on the bag in the first place, etc). – I should learn how to drive with a manual transmission if I plan on driving overseas. Yury and I drove around for a while the day before the event started, doing a tour of the Golden Circle in Iceland (Geysir, Gulfoss, and Thingvellier). Yury at least had driven stick-shift before, although it took him a little time to remember and he hadn’t quite rediscovered the touch before we got back in the evening. – The recession in Iceland is noticeable, as prices have supposedly come down quite a bit. It is still relatively expensive though – even after the decline, it is probably on par with Manhattan. – The tournament was won on tiebreaks by GM Hedinn Steingrimsson, a 34-year old Icelandic GM. There was one amusing story about him (not sure if it’s true, as I couldn’t find it on the web), related by some Slovakian players. It seems he was an IM for some time, hovering around 2400 FIDE without playing much when all of a sudden he shot up. 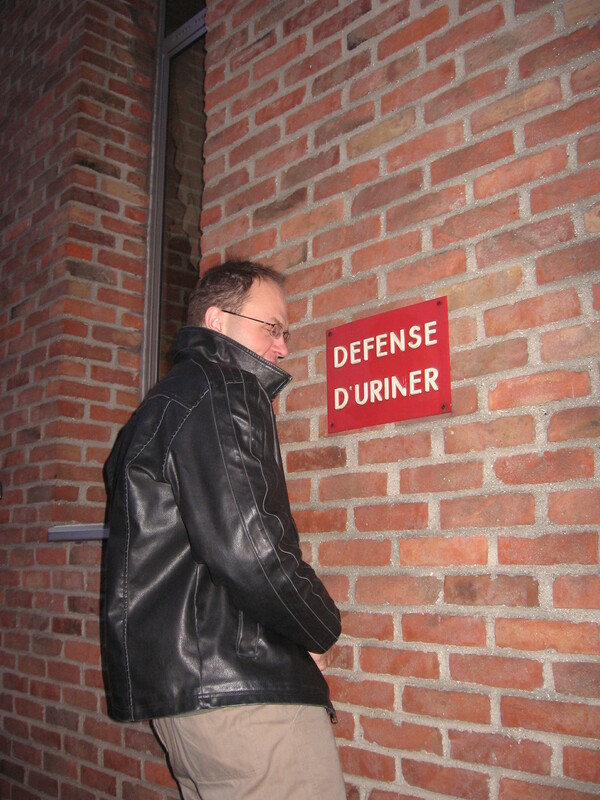 He played a GM round-robin in the Czech Republic where he was then accused of cheating, ostensibly because he was playing well and going to the bathroom quite often. Well, what did he do? Next time he needed to go, he went right on the stage, in the planter box holding some flowers! Indeed. In any case, the cheating allegations didn’t seem to hold water. The tournament in Reykjavik is over, and I finished with 5.5/9. After starting with 2.5/5, I won my next two games, and had high hopes to continue to finish well. I played 28…Bd6 here, aiming at the f4-square. He should have played 29.Bg5, but he tried to hang onto the dark squares with 29.Ne2. I responded with 29…Re8 30.Re2 Rde7 and now he played 31.Bg5, but it was too late. After 31…Ne4, his position is in shambles. He blundered now in time pressure with 32.Bxe7, when I threw in a little zwischenzug with 32…Bh2+!. On 33.Kf1, 33…Nxd2+ picks up White’s queen, and so he played 33.Kh1 allowing 33…Nxf2 mate! I was in some time trouble, so I played the calmer 35.Qd2, rather than take the exchange with 35.Nxc4. After 35…Rc2, I took a 3rd pawn with 36.Qxd5. My opponent then responded with 36…Rxf4!? – a good practical try, I guess, but the move should lose quite simply. However, I made a bad miscalculation and played 37.gxf4 Nxf4 38.Qa8?? Nxg2 39.Qxc8 Bxc8, and all of a sudden, I realized I had to be careful not to lose! I had planned 40.Rc1, but 40…Nxe1 guards the rook on c2. Meanwhile, my king is completely stuck on h1, so after 40.Rf1 Nh4, I had to deal with the threats of 41…Bh3 (threatening 42…Bg2 mate), 41…Bg4, or 41…Bf5. Had I played 38.Qf7 instead of 38.Qa8? ?, the position would have been a simple win. Black doesn’t have enough firepower to justify being down a rook and change. I played 53.Rb7! b2. Now Black is threatening 54…Rh1 55.Rxb2 Rxh2+, skewering the king and rook, so I played 54.Nd4. Now on 54…Rh1, White has 55.Nf3+ and then only 56.Rxb2, as the h2-pawn is safe. The game continued 54…Bd5 55.Rb4, when again if 55…Rh1, 56.Nf3+ and 57.Rxb2 is fine for White. So he got off the 4th rank with 55…Kg5, when I played 56.h4+! – the pawn is taboo because of 57.Nf3+ and 58.Rh4 mate. Thus, Black’s king is forced backwards again and after 56…Kh6, I played 57.Ne2. Now the 2nd rank is blocked so that if the rook leaves b1, White can safely take on b2. Meanwhile, he threatens either 58.Nc3 or 58.Ke3, followed by a king walk to d2. 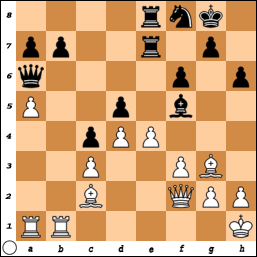 Perunovic played 57…Bc4, but after 58.Rxc4 Rf1+ 59.Kxf1 b1=Q+ 60.Kf2 Qf5+ 61.Rf4 Qxe5 62.Kf1, White has a fortress. He only needs to walk his king between e1 and f1 and Black can’t do anything. A draw was soon agreed. After this disappointing effort, I had the black pieces against IM Robert Ris of the Netherlands in the last round. He played a rather boring line against the Slav and a draw was agreed. Now I have a few days to recover and hopefully rediscover some form before my next event starts in San Sebastian, Spain. We’re through seven rounds in Reykjavik, and I’ve struggled my way to 4.5 points. After winning my first game, I drew my next three and then lost in the 5th round. I managed to get back into the win column yesterday and won today against Magnus Carlhammar. Of my three draws, I should have won both efforts with white. The game with black in round 3 (against FM Thorstein Thorsteinsson) was not very interesting, as he repeated one of my games from Cappelle with a small improvement which kept equality as white. He then didn’t give me any real chances to complicate things and a draw was soon agreed. In round 2, I had the white pieces against FM Axel Rombaldoni of Italy. He played a Stonewall Dutch against me, which was a bit of a surprise. He had played it a number of times, but he had been playing other openings recently. I tried out a new idea (at least for him), but it turned out to be not so great. However, he didn’t sense the danger and played a little too lackadaisically and found himself in a worse position. He then played quite resourcefully, tricking me into accepting a double piece sacrifice to force a perpetual check and a draw. I now played 50.Rb7? Kg7 51.Bc6, thinking that after the exchange of rooks with 51…Rxb7 52.Bxb7 Re8 (to guard the e4-pawn) 53.Rd7 Nf6 54.Rc7, Black would have no defense to 55.Bc6, winning the a7-pawn. But my opponent then played 55…Kf8!, and all of a sudden he was ready to play 56…Re7 to guard the pawn. Had I played 50.c5! instead, I would have had a winning position – after 50…bxc5 51.Ra6!, White will get the a7-pawn, when his b-pawn will be much stronger than Black’s c-pawn. His bishop is better as well, and his king can help out to stop the c-pawn if need be. After missing this opportunity, I pressed for another 40 moves or so (all on the 30-second increment), but I never got another chance to win the game. In round 5, I had the black pieces against IM Clovis Vernay of France. I knew of him as a rather solid player, but when I was preparing for him, I noticed that he was playing a lot of sharp Semi-Slav systems as white. At the start of the game, there was a leak in the roof (the tournament hall is in the courtyard of the Reykjavik Art Museum, and so it doesn’t have a solid roof overhead), and so our table was moved around to a safe area. There were a number of other boards, even those on the stage area, that were similarly affected. I was thinking of bailing out with 16…Qc7, and after 17.Qb3 Nxd5 18.Rd1 N7f6 19.Nxd6 Qxd6 20.Bg5 a4 21.Qc4 Qa6, the position is about equal. Instead, I played 16…Rc8?, and on 17.Qb3, I planned 17…a4 18.Qxa4 Re4 19.b3 Rc5, threatening 20…b5 winning the knight on c4. But after he played 17.Qb3, it dawned on me that he could play 20.Qa7 in that position, saving the queen and his knight! I then looked at 19…Nxd5, but he then has 20.Qa5 (the only move, but it secures an advantage). I had to try 17…Nc5 18.Qb5 Nce4 19.Be3 Bc5 20.Rad1 Ng4, but after 21.Bd4, my position was rather bad. I managed to fight back and still had some chances to draw the game later on, but thanks to a couple mistakes in time pressure, I found myself in a dead lost position after the time control.